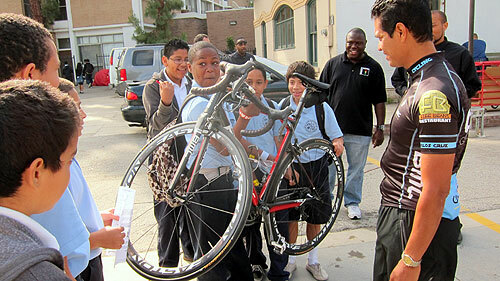 Student marvels at the lightweight racing bike owned by former Olympic team cyclist Tony Cruz. The dust has settled on this year’s Bike Week L.A. May 14-18, but not without a final report on the Bike to School event held at New Designs Charter School – University Campus in Los Angeles on May 18. The first event of its kind held during the official Bike Week encouraged more student bike riding for health and environmental benefits, as well as relieving auto congestion around school zones. The event included a meet and greet for students arriving to school on bicycles, a student assembly with guest speakers from Safe Moves, Metro, LADOT, school officials and others who spoke to students on traffic safety and alternative modes of transportation. Joining the event was former 2000 Olympic cyclist Tony Cruz, who shared his experiences as an Olympic team rider and gave out pointers for riding safely to and from school. The school event was followed by bike safety courses for students during their physical education classes. Check out Safe Moves’ video of the event, which can be viewed by other L.A. area schools interested in encouraging their students to bicycle to their campus. The School Bicycle Safety and Transit Education Program is sponsored by the City of Los Angeles Department of Transportation. Programs are conducted by Safe Moves. Video produced by Safe Moves.